RESPAWN by OFM is a collection of high end racing-style chairs designed for office use or by gamers. The RESPAWN-200 series is a reclining gaming chair defined by its standout mesh-backing, providing a lightweight and supportive experience. With contoured segmented padding, a high back, plus adjustable headrest and lumbar support, this chair provides high-performance comfort whether used during intense gaming sessions or long work days in the office. Additional features include seat height adjustment, height and depth armrest adjustments, 360-degree swivel, and reclines between 90-130 degrees with infinite angle lock. Performance mesh backing increases airflow and helps regulate body temperature while contrasting color upholstery completes the modern, high-quality look and feel. 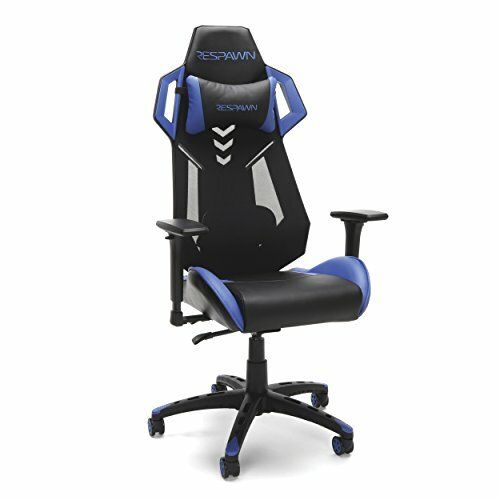 This durable gaming chair has a 275 pound weight capacity and is backed by our RESPAWN by OFM Limited Lifetime warranty. ERGONOMIC COMFORT: This ergonomic chair has a steel tube frame design encased in molded foam which allows for highly-contoured support and an open back seat structure that allows for additional heat control. The adjustable headrest and lumbar pivoting lumbar support delivers comfort that lasts. 4D ADJUSTABILITY: Find your optimal position by raising or lowering your chair, tweaking the height and depth of your armrests, and reclining between 90 - 130 degrees with infinite angle lock. Full 360 degrees of swivel rotation enable dynamic movement. PROFESSIONAL GRADE: Stay cool and in control. A reinforced mesh backing increases airflow to regulate body temperature and enable lightweight support. Use as a gamer chair or an office chair. If you have any questions about this product by RESPAWN, contact us by completing and submitting the form below. If you are looking for a specif part number, please include it with your message.